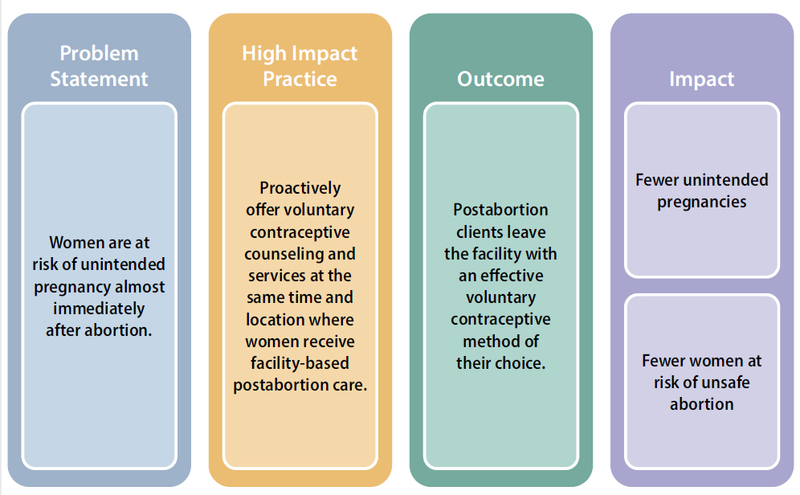 High Impact Practice:Proactively offer voluntary contraceptive counseling and services at the same time and location where women receive facility-based postabortion care. 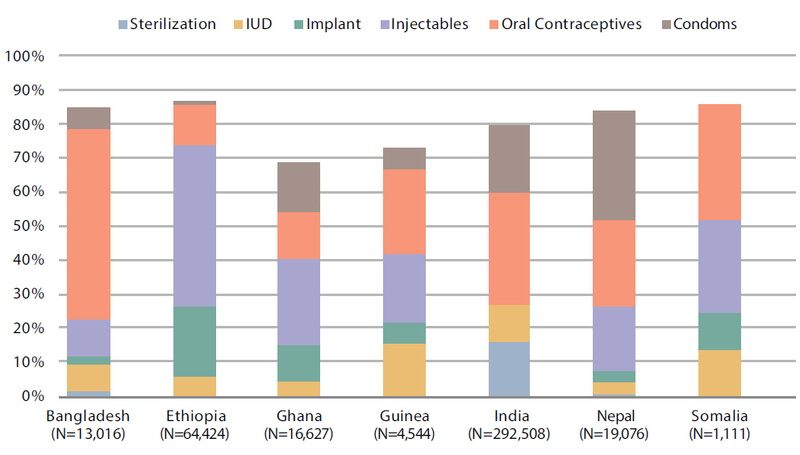 Postabortion family planning is one of several high impact practices in family planning (HIPs) identified by a technical advisory group of international experts. When scaled up and institutionalized, HIPs will maximize investments in a comprehensive family planning strategy.12 For more information about other HIPs, see http://www.fphighimpactpractices.org/overview. * A systematic review and meta-analysis suggests that an interval of less than six months following miscarriage is not associated with adverse outcomes.2 The meta-analysis was mainly of studies from developed countries. Context: Large numbers of women seek care for services related to abortion or miscarriage. What challenges can postabortion family planning help countries address? Many postabortion clients and health workers do not know that postabortion clients are at risk of pregnancy almost immediately after abortion. Fertility can return within two weeks after a first-trimester abortion or miscarriage, within 4 weeks after a second-trimester abortion or miscarriage,1 and, on average, within three weeks following medical abortion with mifepristone or misoprostol.21 However, one cross-sectional study showed that nearly two-thirds of women who received PAC did not know when fertility returns after abortion, and this same group was not intending to use contraception despite three-quarters wanting to postpone childbearing.22 Women who leave a facility without a clear understanding of their pregnancy risk are almost three times more likely to have another abortion than women with accurate knowledge.23 Timely family planning counseling and services can help women prevent a subsequent unplanned pregnancy and possible abortion. Unsafe abortion is a major contributor to maternal morbidity and mortality in developing countries, and postabortion family planning can reduce subsequent abortions. Globally, an estimated 25 million unsafe abortions occur each year,24 and between 4.7% and 13.2% of maternal deaths each year can be attributed to unsafe abortion.25 Around 7 million women are admitted to hospitals every year in developing countries as a result of unsafe abortion.15 The annual cost of treating major complications from unsafe abortion is estimated at US$553 million.20 Unsafe abortion is the fifth leading direct cause of pregnancy-related maternal mortality.25 Preventing unintended pregnancy, including among PAC clients, is fundamental to reducing the consequences of unsafe abortion. What is the evidence that postabortion family planning is high impact? Across a wide variety of settings, data consistently show that acceptance of contraception is high when women are offered counseling and services as part of PAC. A review of evidence from the last 20 years concluded, “Postabortion family planning uptake generally increases rapidly—and unintended pregnancies and repeat abortions can decline as a result—when a range of free contraceptives, including long-acting methods, are offered at the point of treatment …”4 These findings are consistent with earlier systematic reviews.26 Rates of contraceptive uptake in small-scale intervention studies range between 25% and 98%.27,28 Figure 2 provides illustrative examples of voluntary contraceptive uptake achieved in large-scale routine service delivery programs when high-quality postabortion family planning services were in place. Offering information and services to women at the same place and time they receive facility-based PAC is key to implementing effective PAC services. Additionally implementers should consider the following elements in their programs. Address stigma and social and community barriers. Abortion is often stigmatized, particularly in settings where abortion is legally restricted. Seeking care to address complications of abortion or to choose a contraceptive method can be particularly difficult for individuals in these settings or among individuals whose autonomy is limited because choosing to use a method implies her abortion was induced.4 Offering family planning counseling and voluntary contraception to all postabortion clients—both those seeking treatment for miscarriage and those seeking treatment for induced abortion—helps reduce that potential stigma. Encourage and support providers to treat all clients respectfully. Such support often includes, but is not limited to, provider training and values clarification to address provider bias. Training should be reinforced through supportive supervision, job descriptions, operational guidelines and policies, and other types of institutional support. Make contraception free or bundle it with the cost of postabortion treatment. 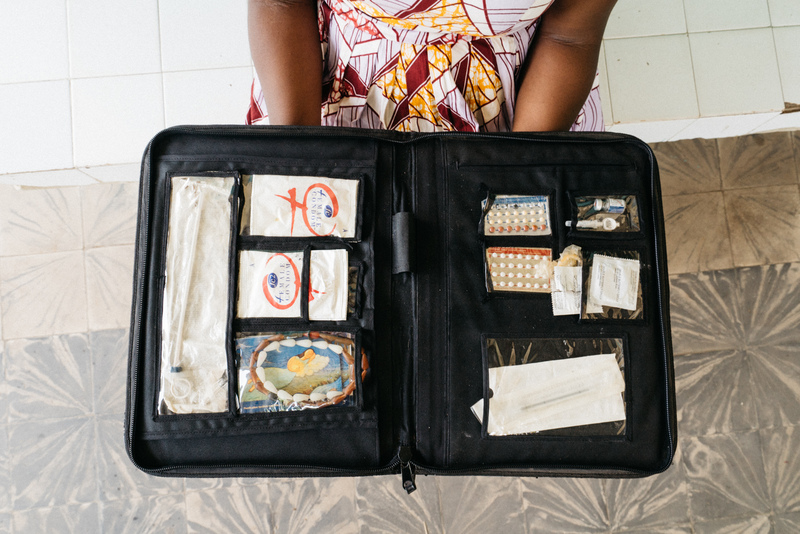 In Burkina Faso, the cost of postabortion contraception is a significant barrier for many PAC clients.58 For adolescents and other vulnerable women, costs contribute to delays in seeking PAC as well as in accessing family planning before discharge from the facility. In Senegal, management of client payments often leads to cumbersome processes, which serve as a barrier to access.59 In Tanzania, where PAC and family planning services are supposed to be free, the average total out-of-pocket cost for PAC clients was more than US$20 (including transportation and treatment of complications, but with no charge for contraception).60 In Russia, the financial cost of an abortion is substantially lower than the cost of using pills or condoms for a year.50 Free contraception, waivers for poor and vulnerable clients, and streamlined payment systems are likely to enhance equitable access to contraception for PAC clients. Hormonal methods: implants, monthly injectables, injectables, combined oral contraceptive pills, progestin-only pills, progestin-only injectables, combined patch, emergency contraceptive pills. Barrier methods: male or female condoms. Intrauterine devices (IUDs): copper-bearing or levonorgestrel-releasing. These can be provided immediately after emergency treatment of complications if there is no infection—or when infection is ruled out and resolved, and any injury has healed. However, IUD insertion following medical treatment of emergency complications requires the patient to return for a follow-up visit. Diaphragms, cervical caps, and combined vaginal ring: can be offered once injury is ruled out or after any injury to the genital tract has healed. Permanent methods: tubal ligation or vasectomy (for her partner). Permanent methods can be offered after the client has had time to rest and recover from any sedation, and is not stressed or in pain. Counsel carefully and be sure to mention available reversible methods. Fertility awareness methods: Standard Days Method or TwoDay Method. It is recommended that women start these methods after their regular menstrual pattern returns. Postabortion Care e-learning course (published May 2018) provides an overview of postabortion care including its definition, objectives, justification, programming best practices, indicators for monitoring and evaluation, and strong evidence base, including evidence-based approaches to strengthen postabortion family planning. Available in English from https://www.globalhealthlearning.org/course/postabortion-care-pac. Postabortion Care resource site is a one-stop source for basic instruments to assist policy makers, program managers, clinical staff, and donors in program design, implementation, and evaluation. Available in English, French, Russian, and Spanish from http://www.postabortioncare.org/. Family Planning: A Global Handbook for Providers (2018 edition) includes a section on family planning in postabortion care. Users can download printable files or order a copy of the handbook at http://www.fphandbook.org/order-form. To compile the list of postabortion family planning (PAFP) documents meeting inclusion criteria, a literature search was conducted using bibliographic databases and hand searching of online websites for journal and grey literature. The period of review focused on documents published after the previous HIP brief on PAFP was developed in 2012 through April 2018. For more information, download the Methods for literature search, information sources, abstraction and synthesis document. World Health Organization, Department of Reproductive Health and Research (WHO/RHR); Johns Hopkins Bloomberg School of Public Health/Center for Communication Programs (CCP), Knowledge for Health Project. Family Planning: A Global Handbook for Providers. 2018 update. Baltimore and Geneva: CCP and WHO; 2018. https://www.fphandbook.org/. Accessed February 27, 2019.
International Federation of Gynecology and Obstetrics (FIGO); International Confederation of Midwives (ICM); International Council of Nurses (ICN); United States Agency for International Development (USAID); White Ribbon Alliance (WRA); Department for International Development (DFID); Bill & Melinda Gates Foundation. Post abortion family planning: A key component of post abortion care. Washington, DC: 2013. https://www.figo.org/sites/default/files/uploads/project-publications/PAC-FP-Joint-Statement-November2013-final_printquality.pdf. Accessed February 27, 2019. Hossain A, Maddow-Zimet I, Ingerick M, Bhuiyan HU, Vlassoff M, Singh S. Access to and quality of menstrual regulation and postabortion care in Bangladesh: evidence from a survey of health facilities, 2014. New York: Guttmacher Institute; 2017. https://www.guttmacher.org/sites/default/files/report_pdf/menstrualregulationpostabortion-care-bangladesh_0.pdf. Accessed February 27, 2019. EngenderHealth. Post Abortion Care-Family Planning Annual Report for the Period October 1, 2016 – September 30, 2017. New York: EngenderHealth; 2017. High Impact Practices in Family Planning (HIP). Family planning high impact practices list. Washington, DC: USAID; 2018. https://www.fphighimpactpractices.org/high-impact-practices-in-family-planning-list/. Accessed February 27, 2019. Singh S, Remez L, Sedgh G, Kwok L, Onda T. Abortion worldwide 2017: uneven progress and unequal access. New York: Guttmacher Institute; 2018. https://www.guttmacher.org/sites/default/files/report_pdf/abortionworldwide2017.pdf. Accessed February 27, 2019. Lule E, Singh S, Chowdhury SA. Fertility regulation behaviors and their costs: contraception and unintended pregnancies in Africa and Eastern Europe and Central Asia. Washington, DC: World Bank; 2007. http://siteresources.worldbank.org/HEALTHNUTRITIONANDPOPULATION/Resources/281627-1095698140167/FertilityRegulationsFinal.pdf. Accessed February 27, 2019. Jones RK, Singh S, Finer LB, Frohwirth LF. Repeat abortion in the United States. New York: Guttmacher Institute; 2006. Occasional Report 29. http://www.guttmacher.org/pubs/2006/11/21/or29.pdf. Accessed February 27, 2019. Kidder E, Sonneveldt E, Hardee K. Who receives PAC services? Evidence from 14 countries. Washington, DC: The Futures Group; 2004. Centre de Formation et de Recherche en Sante de la Reproduction (CEFOREP). Introduction des soins obstetricaux d’urgence et de la planification familiale pour les patients presentant des complications liees a un avortement incomplete. Dakar: CEFOREP; 1998. Senlet P, Cagatay L, Ergin J, Mathis J. Bridging the gap: integrating family planning with abortion services in Turkey. Int Fam Plan Perspect. 2001;27(2):90-95. https://www.guttmacher.org/sites/default/files/article_files/2709001.pdf. Accessed March 15, 2019. Benson J, Huapaya V. Sustainability of postabortion care in Peru. New York: Population Council; 2002. 45 p. https://www.popline.org/node/235774. Accessed February 27, 2019. Undie CC, Obare F, RamaRao S. Replication of the Community Mobilization for Postabortion Care (COMMPAC) model in Naivasha District, Rift Valley Province, Kenya: evaluation report. The RESPOND Project Study Series: Contributions to Global Knowledge Report No. 9. New York: EngenderHealth; 2012. http://www.respond-project.org/pages/files/6_pubs/research-reports/Study9-COMMPAC-Final-Evaluation-December2012-Final-forweb.pdf. Accessed February 27, 2019. Wickstrom J, Russell N, Escandon I. Engaging communities as partners in postabortion care: a desk review of the Community Postabortion Care Project in Nakuru, Kenya. ACQUIRE Evaluation and Research Studies No. 11. New York: The ACQUIRE Project/Engender Health; 2008. http://www.acquireproject.org/archive/files/11.0_research_studies/er_study_11.pdf. Accessed February 27, 2019. Abdel-Tawab N, Huntington D, Hassan EO, Youssef H, Nawar L. Effects of husband involvement in postabortion patients’ recovery and use of contraception in Egypt. In: Huntington D, Piet-Pelon NJ, editors. Postabortion Care: Lessons from Operations Research. New York: Population Council; 1999. pp. 16-37. Kiggundu C. Decentralizing integrated postabortion care in Uganda: a pilot training and support initiative for improving the quality and availability of integrated RH service. Kampala, Uganda: Ministry of Health, PRIME, Ipas, and DISH; 1999. Population Council. Improving the counseling and medical care of post abortion patients in Egypt: final report. Cairo, Eygpt: Population Council; 1995. p. 215. Billings D, Victor A, Baird T, Taylor J, Ababio K, Ntow S. Midwives and comprehensive postabortion care in Ghana. In: Huntington D, Piet-Pelon N, eds. Postabortion Care: Lessons from Operations Research. New York: Population Council; 1999. pp. 141-158. Extending Service Delivery (ESD). A description of the private nurse midwives networks (clusters) in Kenya: a best practice model. Best Practices Series Report No. 2. Washington, DC: Pathfinder International, Extending Service Delivery Project; 2007. Wanjiru M, Askew I, Munguti N, RamaRao S, Homan R. Assessing the feasibility, acceptability and cost of introducing postabortion care in health centres and dispensaries in rural Tanzania. Washington, DC: Population Council; 2007. http://pdf.usaid.gov/pdf_docs/PNADJ505.pdf. Accessed on February 27, 2019. Brambila C et al. Estimating costs of postabortion services at Dr. Aurelio Valdivieso General Hospital, Oaxaca, Mexico. In: Huntington D, Piet-Pelon N, ed. Postabortion Care: Lessons from Operations Research. New York: Population Council; 1999. pp. 108–124. Medina R, Vernon R, Mendoza I, Aguilar C. Expansion of postpartum/postabortion contraception in Honduras. New York: Population Council; 2001. http://pdf.usaid.gov/pdf_docs/Pnacm374.pdf. Accessed on February 27, 2019. Savelieva I, Pile JM, Sacci I, Loganathan R. Postabortion family planning operations research study in Perm, Russia. New York: Population Council; 2003. http://pdf.usaid.gov/pdf_docs/pnacu602.pdf. Accessed on February 27, 2019. Gessessew A. Abortion and unwanted pregnancy in Adigrat Zonal Hospital, Tigray, North Ethiopia. Afr J Reprod Health. 2010:14(3):183-188. http://www.bioline.org.br/pdf?rh10034. Accessed on March 15, 2019. Hakimi M, Hayati EN, Marlinawati VU, Winkvist A, Ellsberg MC. Silence for the sake of harmony: domestic violence and health in Central Java, Indonesia. Yogyakarta, Indonesia: Umea University; 2001. https://www.popline.org/node/571345. Accessed on February 27, 2019. Heise L, Ellsberg M, Gottemoelle M. Ending violence against women. Population Reports. Series L: Issues in World Health. Baltimore, MD: Johns Hopkins School of Public Health, Population Information Program; 1999. http://www.k4health.org/toolkits/info-publications/ending-violence-against-women. Accessed on February 27, 2019. World Health Organization (WHO). Responding to intimate partner violence and sexual violence against women: WHO clinical and policy guidelines. Geneva: WHO; 2013. https://www.who.int/reproductivehealth/publications/violence/9789241548595/en/. Accessed on February 27, 1029. Fikree FF, Mugore S, Forrester H. Strengthening postabortion family planning in Burkina Faso: pre-service and in-service training on postabortion care. Washington, DC: Pathfinder International, Evidence to Action for Strengthened Reproductive Health; 2014. https://www.e2aproject.org/wp-content/uploads/strengthening-pac-fpburkina.pdf. Accessed on February 27, 2019. EngenderHealth. Health system and patient cost for scaling up post abortion and post abortion care family planning services in Tanzania, 2018. New York: EngenderHealth; . Alemayehu T, Biru D, Hendrickson C, Brahmi D, Fetters T. An evaluation of postabortion contraceptive uptake following a youth-friendly services intervention in Ethiopia. Chapel Hill, NC: Ipas; 2016. https://endabortionstigma.org/~/media/Files/PubsManual/PMDETHE16.ashxutm_source=resource&utm_medium=meta&utm_campaign=PMDETHE16. Accessed on February 27, 2019. Hainsworth G, Boyce C, Israel E. Assessment of youth-friendly postabortion care services: a global tool for assessing and improving postabortion care for youth. Watertown, MA: Pathfinder International; 2008. http://www2. pathfinder.org/site/DocServer/YFPAC_assessment_tool.pdf?docID=13121. Accessed on February 27, 2019. Interagency Working Group on Reproductive Health in Crisis (IAWG). Inter-Agency Field Manual on Reproductive Health in Humanitarian Settings. IAWG; 2018. http://iawg.net/iafm/. Accessed March 15, 2019. Nielsen KK, Lusiola G, Kananma J, Bantamby J, Kikumbih N, Rasch V. Expanding comprehensive postabortion care to primary health facilities in Geita District, Tanzania. Afr J Reprod Health. 2009;13(2):129-38. http://www.bioline.org.br/pdf?rh09029. Accessed March 15, 2019. This brief was written by Erin Mielke, Douglas Huber, Carolyn Curtis, and Shawn Malarcher. It was updated from a previous draft authored by Julie Solo and Shawn Malarcher. Critical review and helpful comments were provided by Bethany Arnold, Michal Avni, Hashina Begum, Neelam Bhardwaj, Neeta Bhatnagar, Venkatraman Chandra-Mouli, Elaine Charurat, Arzum Ciloglu, Claudia Conlon, Sweta Das, Isha Datta, Rubee Dev, Erin Files Dumas, Christine Galavotti, Alison Gatto, Laura Ghiron, Kate Gilles, Roy Jacobstein, Antonella Francheska Lavelanet, Grace Lusiola, Sylvia Lynch, Cat McKaig, Alice Payne Merritt, Janet Meyers, Tembi Mugore, Poonam Muttreja, Jean Jose Nzau, Kim Ocheltree, Amelia Ngozi Odod, Japheth Ominde, Anne Pfitzer, May Post, Eric Ramirez, Laura Raney, Ruth Simmons, Sanghamitra Singh, Anand Sinha, Sara Stratton, Nandita Thatte, Caitlin Thistle, and Erick Yegon. Bill & Melinda Gates Foundation, CARE, Chemonics International, Engender Health, FHI 360, FP2020, Georgetown University/Institute for Reproductive Health, International Planned Parenthood Federation, IntraHealth International, Jhpiego, John Snow, Inc., Johns Hopkins Center for Communication Programs, Palladium, PATH, Pathfinder International, Plan International USA, Population Council, Population Reference Bureau, Population Services International, Promundo US, Public Health Institute, Save the Children, U.S. Agency for International Development*, United Nations Population Fund, and University Research Co., LLC. * USAID supports the treatment of injuries or illnesses caused by legal or illegal abortions and counseling on and provision of voluntary family planning options (Post-Abortion Care or PAC).